Help the citizens of Aleswell become visible again. Can you spot Shagol gro-Bumph? Enter the Aleswell Inn and find the invisible innkeeper, Diram Serethi. Explore nearby Fort Caractacus until you find Ancotar, the wizard in question. Ancotar will give you a scroll to undo the invisibility curse. Keep talking to him (raising his disposition, if necessary) until he gives you a ring. Equip the ring and read the scroll in the center of town. Speak with Diram once more. North of the Imperial City, the Red Ring Road runs east to west on the northern side of Lake Rumare. Aleswell lies on the south edge of the roadway, north northwest of the Imperial City, on a promontory that overlooks the Lake. 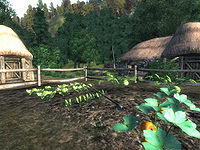 It is a small hamlet with an inn, two houses, a garden, and a sheep pen. Aleswell appears deserted. However, the town's few inhabitants are present, albeit invisible, so you cannot steal with impunity. Either enter the Aleswell Inn straight away—the innkeeper, Diram Serethi, will approach from your right—or find an invisible townsperson, who will then direct you to the inn. Nobody is sure exactly what happened, but Diram suspects a wizard in nearby Fort Caractacus is responsible, given his previous experimental activity to the detriment of peace in Aleswell. It is also possible to start this quest by talking to Malene at the Roxey Inn. Once you have started the quest, the quest marker will point to Diram's location, making it easier to find him. Fort Caractacus is a very short distance back down the hill south and slightly east (towards the Imperial City but on the same side of the water as Aleswell). Watch out on the way to the fort because you are likely to encounter invisible creatures in the area. The creatures are leveled—rats, wolves, timber wolves, black bears, and mountain lions all may be encountered. It is strongly advised that you use Detect Life. Ancotar will be present in the exterior ruins, and in fact will yell at you if he sees you. He may often be found in one of the small rooms on the second level. He initially dismisses you with the comment that he "doesn't want whatever it is you're selling." Keep trying, and he will eventually become resigned to the fact that you're going to have a chat, whether he wants to or not. Ancotar takes pride in his spellcraft, and talks about it at length. When he stops himself from talking about the intricacies of his research, you might reassure him that you're interested (even if you're not), although characters in good standing with the Mage's Guild will not have to choose the "friendly" dialogue options to get everything needed from him. Otherwise, you will have to raise his disposition to at least 71. After he gives you the spell, note that he has not been entirely forthcoming about the spell's potential side effects. Keep talking to him about the scroll he has given you until he gives you Ancotar's Ring of Protection. 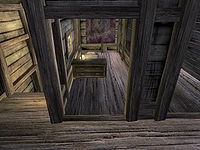 Before you leave, you may want to pick up two skill books from under Ancotar's desk on the second level of the fort's exterior: The Doors of Oblivion and Mystery of Talara, v4, which train Conjuration and Illusion respectively. Equip Ancotar's Ring of Protection and read the scroll in the center of Aleswell. Visit the Aleswell Inn again and Diram will talk to you once more. You will be rewarded with a Fame point and free lodging at Aleswell for the remainder of the game. This room can be used as a makeshift house as the chest in the room is safe to store items in. Failing to wear the ring when you read the scroll will cause your character to suffer 50 points of Damage Luck. Effects such as Resist Magic and Spell Absorption may reduce the damage. If your luck was damaged, the effect can be repaired by visiting a chapel altar or wayshrine, or by using Restore Luck spells, scrolls, or potions. If you fail to use the scroll in the center of Aleswell, you may return to Ancotar and he will give you a second one. However, if you fail to use this one correctly, he will refuse to give you any more and the residents of Aleswell will stay permanently invisible, and you will effectively fail this quest. If you cast the spell while you are near Ancotar, he will become visible, albeit more than slightly angry. If it was your first scroll, he will still give you the second one. The invisible monsters will attack you even if you have equipped the Boots of the Crusader from the Knights of the Nine expansion—these add the Woodland Grace power, which makes normal woodland predators ignore you. 20 I've spoken with Diram Serethi of Aleswell, though I haven't actually seen him. He's explained that all of the residents are invisible; he suspects a wizard named Ancotar is to blame. I should look for Ancotar in the ruins of Fort Caractacus. 30 I've talked to Ancotar, who was unaware of the effect his magic had on the people of Aleswell. He's given me a scroll that should reverse the effects; I need to return to Aleswell to restore its residents. 35 Ancotar gave me a ring and suggested I wear it while casting the Reverse Invisibility scroll, to protect me from any side effects. He didn't mention what those side effects might be. 42 Ancotar gave me another Reverse Invisibility scroll. He said it was his last one. I need to make sure to stand in the middle of Aleswell when I use it this time. 46 Ancotar refused to give me a third Reverse Invisibility scroll after I wasted the first two. I should return to Aleswell and tell Diram Serethi the bad news. 50 I've used the scroll Ancotar gave me, and the people of Aleswell are once again visible. Diram Serethi would probably like to congratulate me on my success. 70 Ancotar is dead, and I have no way of reversing the invisibility he cast on the inhabitants of Aleswell. It is possible to use the console to advance through the quest by entering setstage MS47 stage, where stage is the number of the stage you wish to complete. It is not possible to un-complete (i.e. go back) quest stages. See SetStage for more information. Esta página foi modificada pela última vez à(s) 01h22min de 14 de março de 2014.